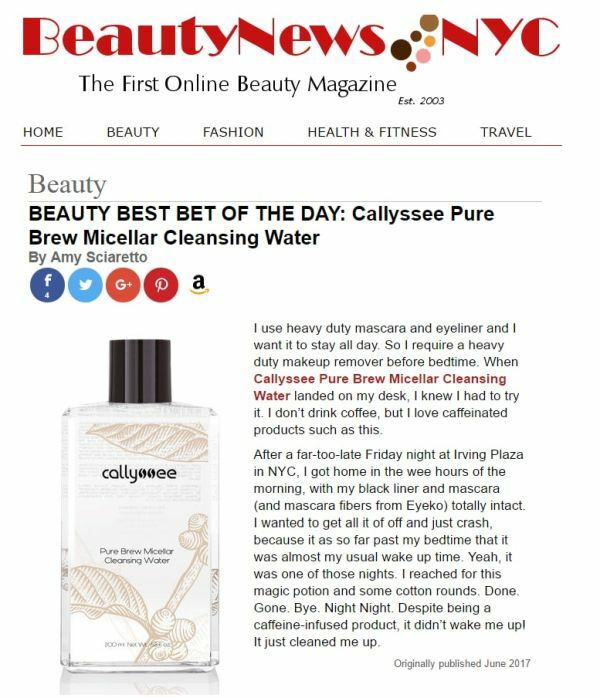 Hello Giggles wrote a review all about the Callyssee Cosmetics line of coffee-infused skincare treatments, and we don’t need coffee to jump up and down in celebration! 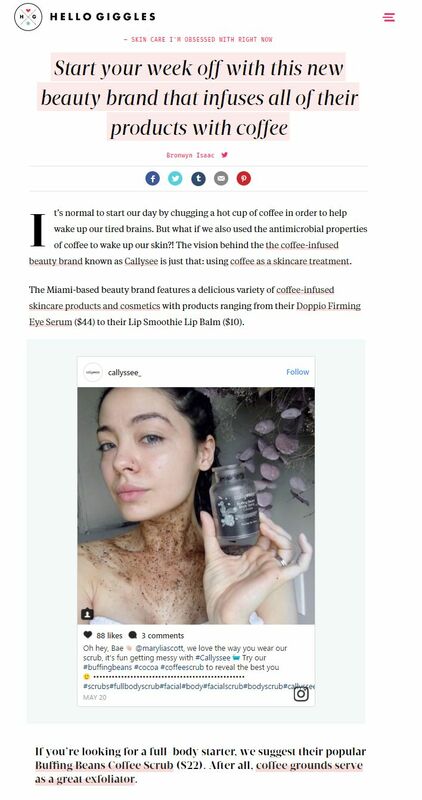 This Callyssee review article highlights the benefits of coffee for skin and our full body scrubs in particular (the Buffing Beans Coffee Scrub available in Vanilla Bean and also Cocoa for the chocolate-lovers), since coffee is particularly excellent for exfoliating skin from face to toes. 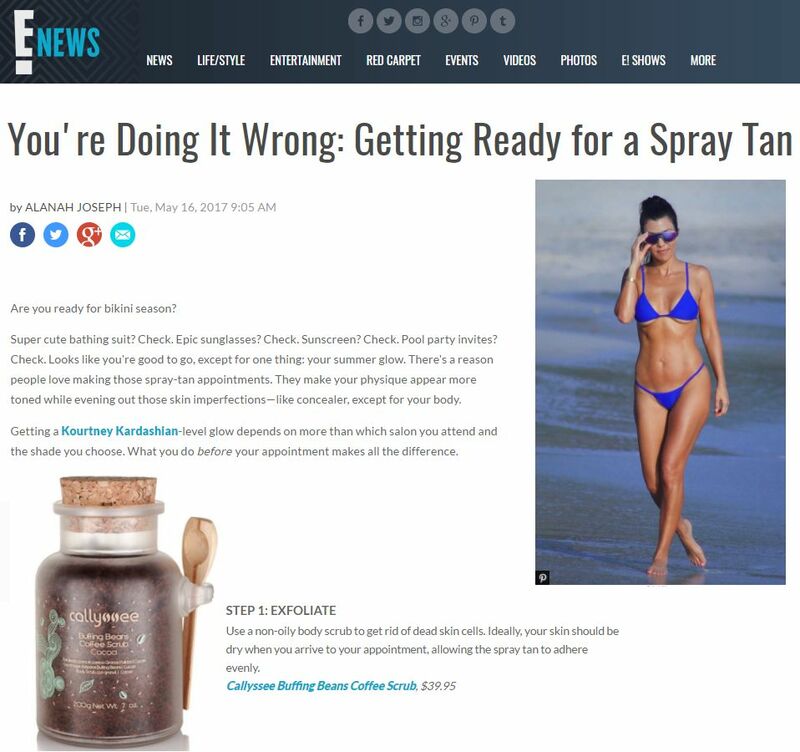 As we prep for bikini season here in the Northern Hemisphere, the first step for the best, glowy spray tan around according to E! Online? Exfoliating! The recommended body scrub to get the glow and softer, more touchable skin from face to toes from E! Online is the Buffing Beans Coffee Scrub from Callyssee in Vanilla Bean and Cocoa. Both are suitable for sensitive skin and won’t clog pores, so they’re perfect to exfoliate your skin from face to toes! Coffee scrubs are said to have long-term results, including increased circulation near areas of application, improved surface skin cell turnover and reduction in the appearance of bumps and ridges caused by cellulite. They also brighten and help revitalize tired, dull skin all over. Feel the subtle graininess as the whole bean ground Coffee Robusta and a generous dose of Brown Sugar work with your own manual exfoliation action to loosen and help you shed the dry, flaky or rough top layer of skin. Coffea Arabica (Organic Green Coffee) Seed Extract, our rock star ingredient, tops things off by targeting the appearance of existing sun damage and babying your skin. Post-scrub, legs, elbows, upper arms, and even your face will appear smoother and more toned. Oh, and in case you’re wondering, you’re looking particularly bootylicious today! Try out the Buffing Beans Coffee Scrub from Callyssee in Vanilla Bean and Cocoa and let us know how much better your spray tan (or your real tan) looks, gorgeous! 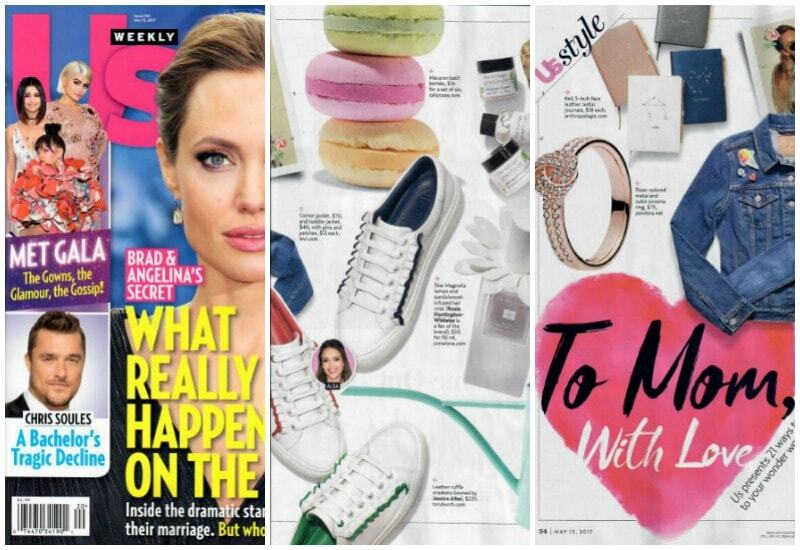 The print version of US Weekly on stands this week is featuring the Fizzy Macaron Bath Bombs from Callyssee as an ideal gift to celebrate mom and show you love her (it’s May 14th, call your mom!). The online version of US Weekly also featured our adorable bath bombs! Our Fizzy Macaron Bath Bombs come in a set of six bath bombs shaped like yummy macarons in three flavors: vanilla, strawberry, and cake for $15.95. Next time you get in the bath, pop these babies into the tub with you and you’ll soften your skin and soothe your achy spots while you relax the day away, Callyssee style. You can finish off with a rich body butter like Smooth-as-Butter Body Butter Brown Sugar or the silky Soft Whipped Body Cream Vanilla to lock in moisture and get that glow on.